Rotarians can make some submissions to be published on this page by using the online form on the right. Click on the "Make a Submission" link. It is with heavy heart that I inform you that Gary Godward from the Rotary Club of Carlsbad passed away on Wednesday. Gary was a very active long-time member and past president of our club. Gary, still a young man, worked very hard for the club and its projects. He was always there with his friendly smile and quiet demeanor, never complaining and always contributing, a true Rotarian. Gary has been ill for several years so he has been absent from our meetings, but never far from our hearts. Please keep Gary, his son, and his family in your thoughts and prayers. District 5340 Model UN - developing the world leaders of tomorrow - today. Led by Del Mar-Solana Beach Sunrise Rotary's very own Charter President Kevin Cahill, District 5340 receives rave reviews and is sought for input to start in other Districts. Our District 5340 is the only one in the United States with a Rotary Model United Nations Program, started by our District's Pathways to Peace Committee nine years ago. The 2013 Conference takes place on April 13-14, 2013 at the Joan Kroc Institute For Peace & Justice, University of San Diego Campus. Students and advisors will stay at the Crowne Plaza Hotel, Mission Valley on Saturday night. This year we are very fortunate to have the Iraqi Ambassador to the United Nations, Dr. Hamid Al-Bayati,as our keynote speaker at Saturday night's banquet.This is the first time we have had a representative from the United Nations as our guest speaker! There will be a limited number of additional tickets for the Saturday evening banquet. We are also pleased to have Brad Barker, President and founder of the Halo Corporation, anti-terrorist experts, as our luncheon/keynote speaker on Saturday, who will give a compelling presentation about the gravity of human trafficking here in San Diego, the United States and the world. Bill Taylor, Past President of the Rotary Club of Vista (a member of the Vista Hall of Fame), died March 30 from complications after a fall near his Vista home that he built in 1951. He was 100. Bill was hired as ranch manager at Camp Pendleton in 1948 and became the first civilian to head the base's natural resources office, managing 125,000 acres, which at one time included 40,000 sheep, cattle and 6,000 acres of crops. He worked for 18 base commanding generals over his 27 year-career at Camp Pendleton and is considered the father of environmental stewardship at Camp Pendleton. He kept the purchase deed for Camp Pendleton in his desk and was known for watching over the base's land and animals as if they were his own. He received a conservation award in 1972 which got him on the CBS Evening News. Bill Taylor's favorite story was about how the American bison got on base in the early 1970s. He told folks how the San Diego Zoo called him up to find out if the base could take a few bison. "Well, I went up and told the Maj. Gen. Herman Poggemeyer Jr., the base's commanding general at the time and he said, 'Can we handle it?' I said, 'Yeah, sure we can." When the bison were ready to be unloaded at the Case Springs reservoir on base, Taylor asked Poggemeyer whether he wanted to come out to see the herd. He did. "I handed the general a cattle-prod ... he went up and chased the bison out." In 1960s, during the construction of Interstate 5 through Camp Pendleton, Bill Taylor told the construction boss to let him know if crews dug up anything that looked historic. They brought him a bone which turned out to be from an ancient mammoth. Mr. Taylor saw to it that the bone was preserved. Today it is on exhibit with other artifacts in the base's Santa Margarita Ranch House museum. Preservation and conservation were at the heart of Mr. Taylor's three-decade long tenure at Camp Pendleton. Bill Taylor was born June 23, 1912 in Redondo Beach to Scottish immigrants. Summer vacations with his family in the Sierra Madre Mountains inspired him to become a forest ranger. He graduated with a B.S. in Forestry in 1938 from the University of Idaho. He was appointed a junior range examiner by the Department of Agriculture Soil Conservation services and later was promoted to unit leader for the newly formed Soil Conservation District in San Diego County. He prepared grazing plans for Navy Department properties, including Camp Pendleton and soon was hired to oversee base's natural resources after he wrote the job description. He dreamed of returning to the open ranges of Idaho that he worked on during summer breaks from college, said his son Matt. Instead he spent most of his working years looking after the ranges of Camp Pendleton. "He was a precise man and sharp until the end; there wasn't one grammatical error in the Rotary's weekly bulletin he worked on," said longtime friend Read Miller. Randy Mitchell so believed in Service Above Self that he did much more than serve Rotary as his club's president and as district governor, he spread his efforts throughout his community, most especially in helping to found the Oceanside Museum of Art. Oceanside Rotary Isn't the same without you Randy. There is no doubt in my mind that not only did you had a big hand in the success of the club over the years, but also your contributed to the cultural and social enhancement of North County. I'll miss your unique brand of humor and the twinkle in your eyes. It is my unfortunate duty to bring you some sad news. Randy Mitchell passed away Feb 5, 2013 at approximately 9:30 p.m.
Randy was Past District Governor of Rotary District 5340 and Past President of our Oceanside Rotary Club. He was active in so many things in Oceanside - but will always be remembered as one of the driving forces of the Oceanside Museum of Art in its very early days. I remember his sharp sense of humor that always provoked a laugh even from the person being skewered. Our thoughts and prayers go to Carol and the rest of her family. Services are scheduled for Saturday, Feb 16 at 1.00 pm at the First Presbyterian Church in Oceanside. Dear 5340 Friends -- As a fellow military retiree, I served as Aide & Executive Assistant to District Governor Randy Mitchell. I first met many of you when I accompanied Randy on his club visits. He was a wonderful friend who gave me a lot of Rotary advice and I certainly count him as one of my main mentors. It was good to see many of you during last month's POR. But it is terribly difficult not being with you in Oceanside for Randy Mitchell's services. 8/16/2012 - A group of Rotarians from the Rotary Club of Carlsbad helped serve breakfast at Brother Benno's Thursday morning. They were also happy to be able to present a check to Brother Benno's for $500 on behalf the McCarty Estate Trust. Pictured (left to right): Elaine and Bob Nielsen, Ursula Monaco-Sweeney, Ray Pearson, Denise Seymour (Bro. Benno's), Terry Maher, Chungsam Doh, Roy Meenes, and Renuka Sethi (also present but not shown was Keith Kennedy). Last Thursday (8/9/2012) at the weekly Rotary Club of Carlsbad meeting, Nerice Kaufman took off her hat as President of San Luis Rey Rotary Club and assumed her other role as Executive Director Hospice of the North Coast. She explained the workings and purposes of hospice, and pointed out that the North Coast operation was one of only three non-profit organizations of this type in the entire county. Many of the members' unspoken questions were answered in her talk, and it was reassuring to know that a caring, professional and compassionate service is available to us locally in time of need. Thanks to Nerice and her tireless staff and volunteers for bringing peace to the lives of so many. There will be an article in the San Diego Union Tribune about Jack on 7/17/2012. . .you can view it on line under News, North County. But Jack's involvement in Rotary, and our community didn't end there. Both he and Jill became Rotarians, supporting PolioPlus in his hope to eradicate the disease before he passed on. He served on the Escondido City Planning Commission for 11 years, became the Chairman of the ADA committee of the California Center for the Arts Escondido, was active in the Polio Survivors Rotarian Action Group. He founded and helped to organize and run the Plays in the Park in Kit Carson Park, the Felicita pageant, as well as supporting the Patio Playhouse and Theatrx. There are more things that he did and more organizations that he supported: The Escondido Rotary Foundation, the Escondido Charitable Foundation, . . . I could go on. Little known facts about Jack: He earned money for college by going to Vegas and winning at Blackjack (he could "count cards!"). In only four years he earned BS and MS degrees in Math at UCLA. Well known facts about Jack: he was a wonderful man, a good friend and an inspiration to many. Jack was a gentle, brilliant, good humored, humble, and kind man who often thought creatively and "outside the box." He made the most of life, never letting polio get him down and making good friends wherever he went. Once, many years ago he even persuaded two friends to drive 2300 miles across the country to rescue a family member in Canada! He loved a party, and loved socializing with good conversation, making friends easily. He always saw the good in people, and always looked upon the glass of life as more than half full. Jack and Jill were a team. They burst upon the Rotary scene as total unknowns to our club, with an unsolicited challenge of matching their $12,500 for Polio Plus. That challenge, along with the help of Bob Tomko and many, many others in the district ballooned to over $137,000. And as noted above, it enabled our District to fund the NID in Eritrea, to which Steve Brown, Marty Peters, Mel Gallegos, Chuck and Kate Duvivier and I traveled. Thank you for letting us know Larry. I first met Jack when then Escondido President Dr. Nick Tsoulos asked him to contribute money for Polio Plus. 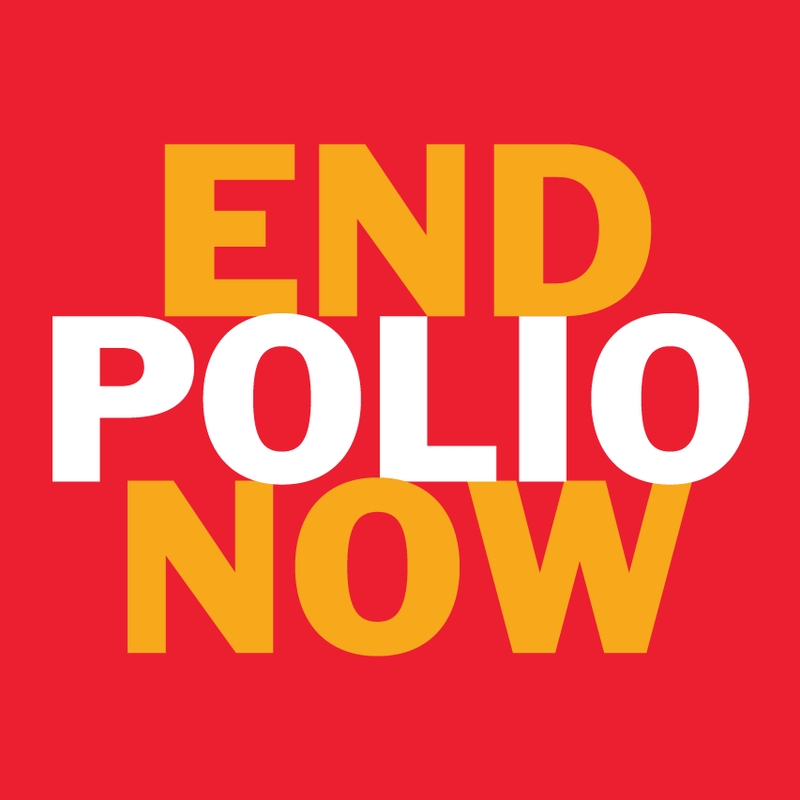 Nick & I were on a committee with PDG Larry Scott, going all over the District putting on a program, making Rotarians aware of Polio and how were trying to knock it out in the world. Soon after Jack Campbell made a large contribution, he became a member of Rotary. Jack and Jill attended our 60th Anniversary party in Carlsbad. Jack was a special friend, and we will certainly miss him. Our heartfelt sympathy to his widow, Jill. Yes this is a sad time for all of us in Rotary and Escondido. He was a great guy, and he and Jill made a great team. I just want to set the record straight, that Jack Campbell first approached Escondido Rotary challenging us to match his $12,500 donation to Polio Plus. When we matched that, he raised the ante to $20,000, and totally we raised about $46,000. That was the year you and I were co-chairs of Polio Plus for the District, and all told, the District raised over $135,000 for Polio eradication that year, paid for a NID (National Immunization Day) in Eritrea, the year that 4 San Diego Rotarians went to Eritrea for the NID. You were a great part of that year, Bob. Remember going to those clubs together giving talks to raise money to get rid of that disease? Jack Campbell would have loved to have eradicate Polio before he had died. We've only got 3 more countries to go, now. And darn few cases of Polio. Jack and Jill can be proud of what they have done, not only with PolioPlus, but with all their other endeavors, and the true friends they have made. I am so sorry to hear of Jack's passing. Jack and Jill became great friends of Carol and myself and it was always a special occasion to go out to dinner with them. I learned so much ...first hand...about Polio and the challenges it presents to people when their life becomes impacted by this disease. I so admired Jack as he never complained about the many physical challenges that he faced on a daily basis but chose to always look on the bright and positive side of things. He was truly an inspiration to so many of us.not only in the manner he conducted his personal life but his commitment to Rotary and especially to its program to eradicate Polio. So sorry he could not have lived to see this disease eliminated from the face of the earth. I am so very, very sorry to hear this. I will always remember Jack saying that he hoped that polio would be gone before he was gone. Sadly, we didn't do it for him. Guess we'll all have to work harder on his behalf. Jack Campbell may have been small in stature but he was a Giant! I know that I looked to up him for inspiration. He was generous with his time; his energy and passion were always on display. His ability do good locally and internationally will be hard to equal. He One of the "biggest" men we ever had the pleasure of knowing. The eternal Rotary Club just got one great member. All who knew him were made better by him. It is always sad to lose a friend. God bless his soul. So very sorry to hear the news of Jack's passing. He will be missed by so many of us, yet he serves as an example of an outstanding Rotarian. We send our thoughts and prayers to Jill and family. We are all saddened to hear the news of Jack's passing. He was a fighter for Rotary and to eradicate Polio--we must keep up the good fight in his memory. Thank you for taking the time to let us know about Jack. He was certainly a GIANT among men - Dedicated to helping his fellow man and most especially the eradication of Polio. Our thoughts and prayers go out to Jill and the Campbell family. A tremendous loss to us all. I've been thinking about Jack since I got the message yesterday. I didn't know him as well as most of you did but I was always struck but his positive can do attitude. We have clearly lost a great 5340 Rotarian. My heart goes out to his family. I am saddened to learn of Jack's passing. He was an amazing individual and a good friend. He did much to assist the Polio Survivors Rotarian Action Group in his fledgling moment as it transitioned from a Fellowship to a Rotarian Action Group. Jack will not be forgotten. Larry, Thanks for this Announcement I want all to remember Jack and Jill's Passion . He Joined our Rotary Family in 1998-99 The year I served as Governor. Directly as a result of his Joining We raised over $137,000 That year From All Clubs His efforts and Challenge to Escondido Was Absolutely Amazing. In Early 2000 we traveled to Eritrea. Jack and Jill Walked the Walk! We are all better to have had Jack in our lives. We are blessed to have known and loved him. Mary Alice and I, as all of us have been blessed by having Jack and Jill enter our lives . Jack was one of the most inspirational men I have ever met. He let nothing deter him. In his gentle, kind way he was incredibly effective in making this world a better place for the rest of us. I admired him greatly. We will all miss him. At the Bangkok RI Convention, Timothy Sankary, President-Elect of the Rotary Club of Convoy, met with the International Fellowship of Rotarian Doctors and the RI action group, Rotarians for Fighting AIDS and was appointed 5340 District Chair for this action group. With over 30 years as a physician epidemiologist specializing in AIDS prevention, research, care and policy, he is available to all Rotary Clubs in the District to give a presentation about the new RI direction in fighting AIDS. Please call him at 619-665-1650. Jeffrey Marxen, MD. A man of great energy and spirit died on the evening of February 23, 2012, in an, as yet unexplained, motorcycle accident. We will never forget his keen sense of humor, great laugh, the twinkle in his eye and his loving attitude. Jeff will be remembered as a devoted husband, loving father, and great friend to many. Dr. Marxen was known as a highly skilled orthopedic surgeon who loved what he did, always sought perfection and cared for each of his patients. Dr. Marxen was born on April 2, 1951 in Lakewood, Ohio to Dr. Norman Marxen and Mrs. Marilyn Marxen Molyoka. He was a graduate of Culver Military Academy, the University of Toledo, and the Medical College of Ohio. Upon completion of his orthopedic residency at Henry Ford Hospital in Detroit, Michigan, Dr. Marxen moved to San Diego to set up an orthopedic practice, with a focus on joint replacement. Jeff made many contributions to his profession and his community. Jeff served as Chief of Orthopedics and Chairman of the Medical Records Committee at Sharp Grossmont Hospital after presiding as president of the San Diego chapter of the Western Orthopedic Association. Jeff loved and enjoyed a full life, living each day as his last. Jeff never lacked for an opinion and was eager to debate the virtues of just about any subject. He enjoyed participating in men's softball leagues, tennis, golf, skiing and basketball. He was an active member of the La Mesa Rotary and served in multiple positions including president. He played the coronet and trumpet with the Acme Rhythm and Blues band as well as in the Sharp Grossmont Hospital's band, Soul Purpose. Jeff is survived by his wife Dr. Annette Conway Marxen, his children Philip, Jeffrey, and Marissa and step-children Sean and Todd Conway. Ernest G. Pero, Jr., passed away Tuesday, February 21, 2012. Ernie served twice as President of the Lemon Grove Rotary Club. In 2004-2005 Ernie served as President of Distict Council and was known thoughout the District for his wonderful invocations. Please see the Web Link for Service information. Russ spoke words of praise of Ernie Pero at the memorial service last week to many nods of agreement in the audience. Russ concluded his tribute with familiar words Ernie frequently used to conclude his invocation at club meetings. "Father we thank you for letting us be Rotarians so we can do some of your work here on earth. We pray that on that day,when we stand before you in judgement, we will hear you say, "Rotarian, Rotarian, with you I am well pleased"
For the complete tribute use link below.